STORMWARRIOR The Warrior Conquers All! German Vikings? Never heard of? Well, think again, because the latest and most successful Viking pillage tour hails from our Teutonic neighbors. Band leader Lars Ramcke and then drummer Andre Schumann raised the banner the first time back in 1998, inspired by the metal scene of the 1980´s, not least German bands like RUNNING WILD and HELLOWEEN. And who better to tell of the current battle status within the Viking camp than Lars himself, hail battle swordsman, what news bring ye? 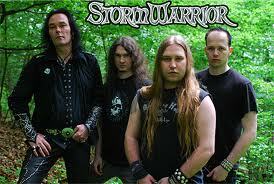 -“Heathen Warrior” is definitely the most “grown-up-sounding” album STORMWARIOR have done so far. After having released an album like “Heading Northe”, which was pretty well embraced by everyone, of course everybody who loved the last album had developed his own expectations concerning our next output. - Don’t get me wrong, it is not that we don’t take care about our followers, but concerning songwriting this is completely up to the band, so in the end it is always the same, like with every other band (that is not stagnating), the band, the songs and the sound are developing and going forward - the only question that is left in the end is whether the fans and followers are willing to follow the band and if they accept the development of the band. I don’t think that we really changed somehow since the last album, it is just that we concentrated on featuring different aspects of our sound than before to let the band and the sound develop and to open the sound-spectrum once in a while. After the drum-session we recorded at different places at the same time before everything was put together in our own studio then to see if everything really fits together…haha! - Well, somehow it did fit and we could finally go to Tommy Hansen to get the final sound for the album. Since Tommy already did the mastering work for the last album and we were really impressed by his collection old vintage equipment which goes partly even back to the 60ies. It was very clear for us back then already that we wanted the whole mix & mastering be done by Tommy this time to get a real great warm analogue sound onto our new album. It seems that today most people got their ears used to the new sound of digital recording equipment with all these digital plug in versions that try to imitate the originals, but for us there is always something missing, and that is this “certain something” that one can only receive from the old original gear. - So we are very happy with the result and with Tommy’s work and we love this “80-ies sound”, even if it’s still up-to-date somehow. My favorite time during the production has been of course the moment when everything was finally on tape and we started to mix with Tommy to discover some of his old treasures in his gear-collection and we could finally concentrate on the sound instead of recording and arrangements etc. It has been definitely the hardest production so far, because we recorded again everything on our own but this time we have been under time pressure from day one on. So actually sometimes it felt like fighting against windmills and after having worked on the album for almost a ¾ year including songwriting etc. you are really glad somehow that it is done…haha! But after listening to the final album of course every single second of work became worth it again! FP: What has happened since your last album “Heading Northe”? - Two main things happened which actually held us back from working for quite a long time. First of all Falko, our drummer back then started a family and decided to leave the band after almost 6 years and of course it is always a heavy thing for a band if one of the main pillars breaks away. But gladly we found a good replacement soon with Hendrik, who played in Kingdom Come before and was actually yelling to get the chance to play some faster music. The second thing was, that our last record company Dockyard got into trouble caused by some personal mistakes and misbehaviors of some single label-holders which also lead to the end of the label. That really threw us back financially but also working-wise, because we suddenly had to get a new deal very soon but didn’t have the time before to get some new material together for a new album to be released very soon after signing a new deal. So with Massacre we finally got onto our feet again and could continue with “normal” work and the result we’re holding in our hands right now. FP: How would you describe the band members (don´t hold back)? Well, I am not talking about their musical skills or about the way we can work together. This is all fitting together perfectly. I guess I never saw him really aggressive or losing his countenance. But it is really funny watching him getting and being drunk though. He has always been something like the perfect counterpart if someone tends to overreact or to follow irregular thoughts or visions. Maybe somehow he keeps the balance in the band. While being on tour Hendrik (Thiesbrummel, drums) seems to be one of those guys who is always sitting there waiting for the flight, never ever leaving his fingers off of his notebook or Iphone (or whatever that is) and while talking with you, you can actually read his thoughts like “could you please speed up talking, there is another message waiting to be answered by me…” or “…yeah, yeah, just continue blahblahblah, you are drunk and in five minutes you won’t remember what I just said anyway…”…haha! And Yenz (Leonardt, bass)… well, Yenz… I guess Yenz is simply out of this world…haha! He is probably the most smoking man I have ever met. He is the last guy who enters the aircraft and the first one who leaves it and sometimes he is very hard to find at the airports, because every second you spend in a non-smoking area in a non-smoking status seems to be a wasted one…haha! FP: What is the core of STORMRIDER? - I’m sorry but how could I know what is the core of StormRIDER? Is this a band as well? Or a PC-Game? (I don’t play PC-games though…). FP: Where are your biggest fan bases? Who is your average fan? - So far (based on the sales of the last album) we still have the biggest fan-base in Germany and Japan. Great-Britain and the States are also growing very well at the moment. Speaking of Scandinavia, then Sweden would be the biggest market, while Finland is growing as well. FP: What happens next, PR, touring, festivals etc? Any chance of gigs etc. in Scandinavia? -Yeah, right now every day is completely filled with Interviews and Promo-work before we start with rehearsals for the festivals. We are also collecting some dates for autumn / winter and hopefully we can as well come back to Scandinavia with the new album. Of course it would be a bit late right now to jump on anything for this summer, but I am pretty sure that we will have some further possibilities for autumn or winter though. -Thanks go out to you for this interview, my friend!